Motherwell & Wishaw Burgh Police was established in 1930 having previously been policed by the Lanarkshire Constabulary. It had 70 officers when established. In 1967 it amalgamated with Airdrie Burgh, Coatbridge Burgh and Hamilton Burgh to become part of Lanarkshire Constabulary once again. At that time the force had 154 officers. 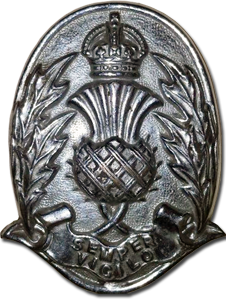 The force adopted the national cap badge (as shown above) in 1930 with collar badges bearing the roped and intertwined letters MWP. It was agreed, in 1914, that Motherwell should have its own Burgh Police Force. The Chief Constable was named and badges, buttons and first-aid badges were made but never issued as the 1914 war interrupted the formation plans.